Rank and Organization: Boatswain's Mate, U. S. Navy. Died: 2 Apr 1899, Enid, Ok.. Credited to: Vermont. G.O. No. : 59, 22 Jul 1865. Citation: Served on board the U.S.S. 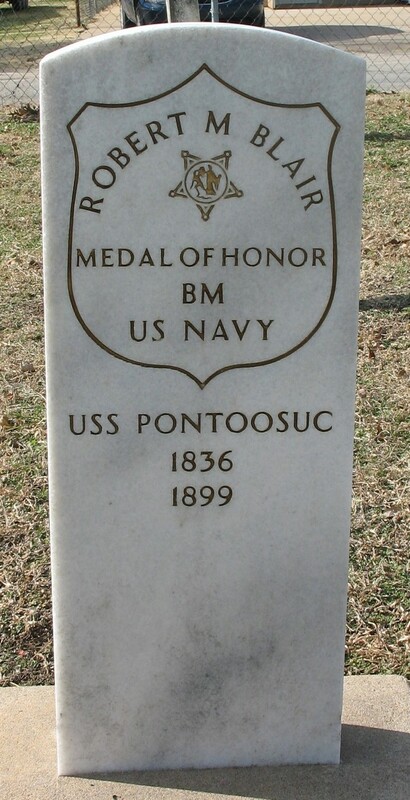 Pontoosuc during the capture of Fort Fisher and Wilmington, 24 Dec 1864 to 22 Jan 1865. Carrying out his duties faithfully throughout this period, Blair was recommended for gallantry and skill and for his cool courage while under the fire of the enemy throughout these actions.